Brownwood Cemetery in Sandersville, Washington County, Georgia is where a few of my cousins were laid to rest. Two of them were German Fields Womble and his wife Zannie Peavy Womble. They were united in marriage in the year 1913, and they both died in the year 1969 -- only one month apart. G. F. died the 30th of August, and Mrs. Zannie died the 30th of September. Here are their obituaries from the Augusta Chronicle (Georgia). SANMDERSVILLE, Ga. -- Funeral services for German Fields Womble, 79, of Sandersville, will be held at 3:30 p.m. Sunday at Sisters Baptist Church with the Rev. Milton and the Rev. Albert Stroup officiating. 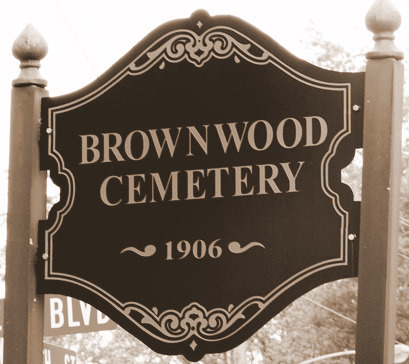 Burial will be in Brownwood Cemetery. Survivors include his widow, Mrs. Zannie Peavy Womble, two sons, Charles H. Womble, Boynton Beach, Fla., and Louie Womble, Sandersville; daughter, Mrs. Lola Daniel, Orlando, Fla. He was a member of Sisters Baptist Church, the Hamilton Chapter of the Masonic Lodge and a retired civil service employee at Robins Air Force Base. He had lived in Sandersville all of his life. SANDERSVILLE, Ga. -- Funeral services for Mrs. Zannie Peavy Womble, 77, of Sandersville, who died Tuesday, will be held at 4 p.m. today at Sisters Baptist Church. ...Burial will be in Brownwood Cemetery. She had lived in Sandersville nearly all her life and was a member of Sisters Baptist Church. Survivors include two sons, Louie Womble, Sandersville, and Charles H. Womble, Boynton Beach, Fla.; daughter, Mrs. Lola Daniel, Sandersville; three sisters, Mrs. Melinda Russell, Mrs. Clara Mae Horton and Mrs. Lena Holt, all of Macon. Friends may call at Lang's Chapel until 3 p.m.
Love your cemetery blog. I found it by searching the cemetery blogs at Geneabloggers. Just added it to my Google Reader, and my links on my genealogy and cemetery blogs.